"The day will come when even your most heartbreaking memeories will be important to you." 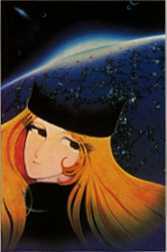 Maetel is the daughter of the mecha Queen La Andromeda Prometheum and the sister of Emeraldas. She can be described as a woman with a mystery no one wants to solve. To solve it would mean to uncover terrible secrets no one (not even herself) wants to face. At times, Maetel can smile and be friendly. Other times, she's stern; other times, sad. And perhaps most of the time, she's contemplating. She had been riding the galactic rails for a long time, it seems. She carries wisdom that is beyond her apparent years, and it sometimes shows in her face and in her reactions. Maetel has been on a mission for her mother, Queen Promethea, a mission which Maetel doesn't want to carry out, but she has to, for her father's sake. Her father, Dr. Ban, is always literally close to her heart, locked in energy stored within Maetel's pendant. He had opposed Prometha's dreams of empire and now has a plan to destroy those dreams. However, to do it, Maetel has to follow her mother's wishes, to bring people to Andromeda (the planet's name before it was named Andromeda was La Maetelle). How it tears her heart that these people must be made into a part of Promethea's Machine Empire, if only to eventually bring about its downfall. Maybe it's because her body is a copy of Tetsuro's mother, or maybe she needs an outlet for her own emotions, but she seems to have a love for Tetsuro that is like that of a mother. And it's probably this that finally drives Maetel to oppose her mother openly. She will NOT let Tetsuro be subjected to the same fate. In Adieu Galaxy Epxress 999, some new secrets about Maetel come to light, such as her strong resemblence to a former queen of Lar Metal and her being the new queen of the machine empire. These images combined with Tetsuro's own impressions of her show the conflict that she still faces and sheds new light on her true purpose.